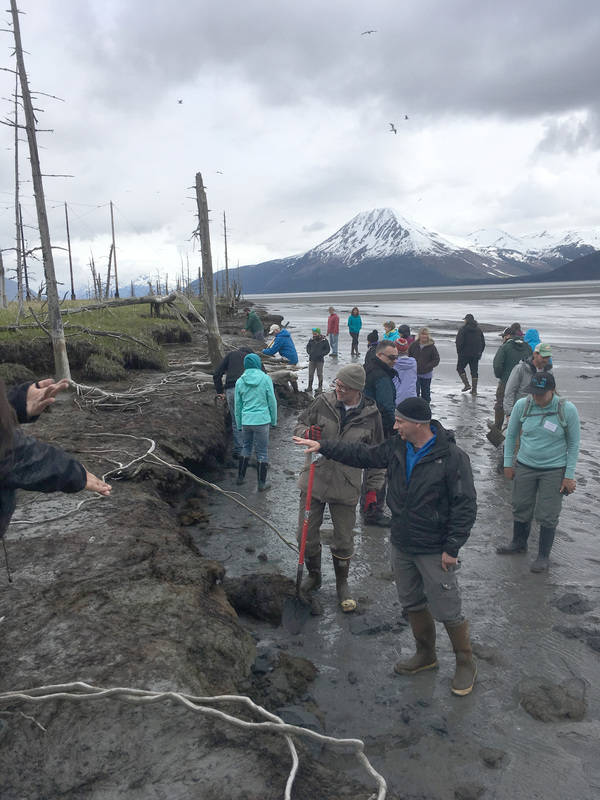 ANGLE 2018 Educator Workshop participants visit the Girdwood AK ghost forest that formed when land levels dropped during the 1964 Alaska Earthquake. Are you an educator in science, natural history, or emergency management? Want to discover more about amazing Alaskan geology and geohazards and learn new ways to help your learners increase disaster preparedness? This 4-day professional development workshop brings together K-12 educators, parks & museum interpreters, and emergency management and health & safety educators. Participants learn the basic science of earthquakes, tsunamis, volcanoes, EarthScope, preparedness, and other research efforts to monitor the Earth in Alaska. They explore the topics in a hands-on learning environment and a field trip. Participants receive an educator kit containing high quality physical and digital resources to support the transfer of teaching activities to classrooms, interpretive sites, and other learning venues. On the last workshop day, participants develop action plans for conducting collaborative science and engaging our communities on the mitigation of coastal geologic hazards. Participants will present their progress on the action-plans at the follow-up Share-a-thon on February 2, 2019. Primarily for educators from Anchorage, Kenai Peninsula, and Kodiak. Other areas of Alaska will be featured in other years of the EarthScope ANGLE project. For those who cannot accept stipends, equivalent funds are available for posters, exhibits, signage, or other educational or interpretive materials. Educator "kit' with materials for classroom and interpretive activities on earthquakes, tsunamis, volcanoes, EarthScope science, and hazard mitigation. Opportunity to join the Quake Catcher Network (QCN) and have a seismometer installed at your educational or public institution. QCN has thousands of team members collecting earthquake data around the world. Advice from ANGLE instructors regarding classroom activities as well as interpretive programming, exhibits, and signage development.